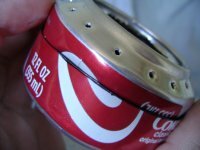 If all you want to do is boil water, consider making the cat food can stove instead of the soda can stove. 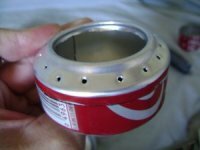 It's even easier to make than the soda can stove—plus it's lighter and acts as a built-in pot support! But if you need to do more than boil water, you're in the right place! 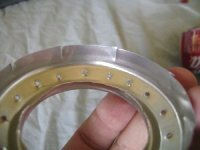 The instructions here describe how to build the burner, but you'll also need a DIY pot support to go with it for this design. Most materials you need are probably already laying about your place. 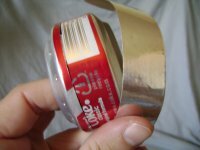 The one thing you might not have is a tape that won't burn when you use your stove. 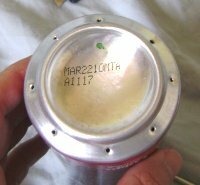 You can find a high-temperature tape in any decent hardware store. 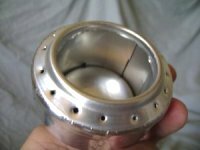 It's designed to be used on flues or mufflers or something—I don't really know. But it's made of material that won't burn or melt. 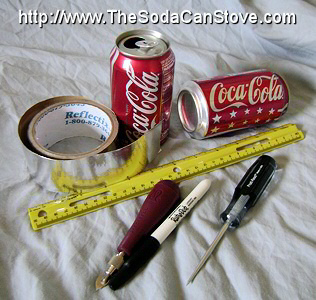 A roll should cost under $10, but you can probably make a hundred stoves from a single roll. You don't need much! 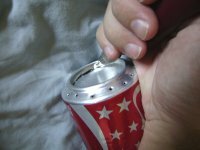 Some people claim that the Pepsi can is the superior soda can option. 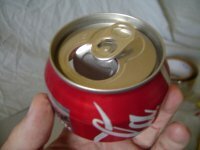 I've used cans of Coke, root beer, and even grape soda and never noticed any difference, so drink what you like! It doesn't really make any difference! 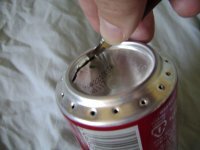 Poke holes along the bottom edge of one of the cans with the scratch awl. Some people say smaller holes are more fuel efficient. 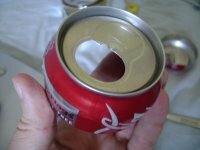 Some people like bigger holes since it burns faster and hotter. I like 'normal' holes. 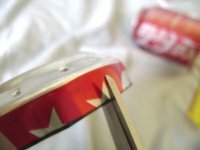 The number of holes isn't especially important—just so long as they go around the rim more-or-less evenly. I typically poke two holes on opposite sides, then two more holes halfway between the original holes. Then four more holes between those first four. And then another eight holes between those first eight for a total of 16 holes. 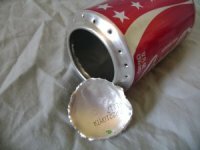 Cut out the bottom of the can you just poked the holes in. 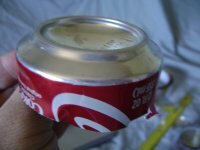 The can is fairly thick here, so it needs to be a sturdy instrument to do this. 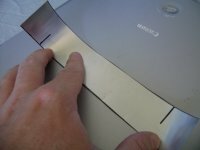 An X-acto knife would work, but use one with a heavy-duty blade on it. I'm using a knife from a Speedball linoleum cutting kit. Use whatever you have available. If the edges turn out particularly jagged, you can file them down now. (Or later, or not at all—doesn't matter to me!) If you have trouble with this, check out this YouTube video for help. 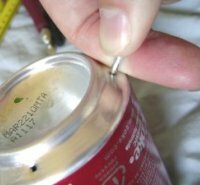 Measure up 20mm (3/4 in) from the bottom of the can and cut. This will be the top of your stove. 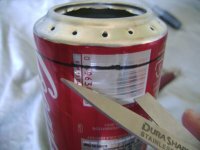 To get an even cut, I mark a point at 20mm, then keep a Sharpie steady on a table while turning the can around against it. 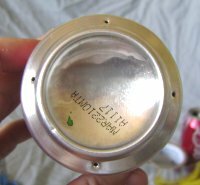 A clean, even mark completely around the can every time! 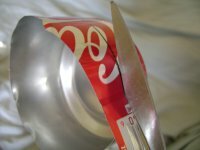 It's easier to get a clean cut if you first do a rough cut to get the end of the can separated, then a second cut directly along the mark where it needs to be. Snip the edges of the stove top several times to form tabs. 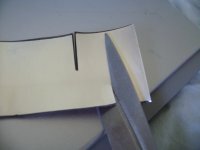 We'll be fitting the top of the stove into the bottom of the stove and these little tabs help insure it fits! 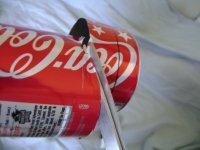 I make eight evenly spaced snips around the stove top, to a point just below where the paint on the can stops. 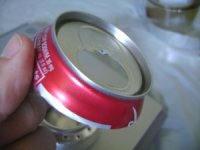 Now it's time to grab a new can and cut out the bottom of it. 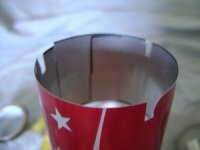 Don't poke holes in it or cut out the bottom like you did for the top of the stove. 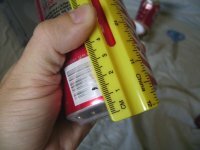 This time, measure 25mm (1 in) from the bottom of the can and cut. 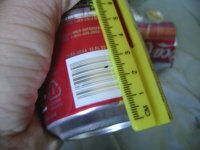 If you want to get wild and crazy, you can make your stove as tall or short as you want by adjusting this measurement so it's 10mm shorter than the final height you desire for the stove. For your first stove, stick with the standard 25mm. 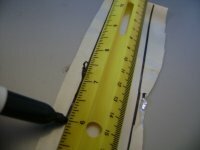 Measure, mark, and cut. Size the inner wall in the stove bottom. 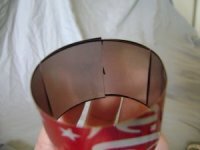 You'll cut halfway through the strip on each end on opposite sides of the strip where the ends will lock together. 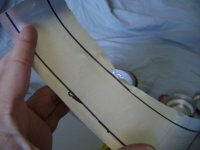 When you lock the ends together, make sure the ends of the strip are inside the loop. It's self-locking and more stable that way. I've put a red X with the photo that shows the incorrect way to lock the ends of the inner wall. Trim the inner wall. 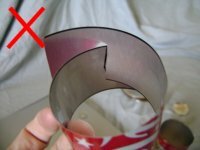 You can cut a small bit off the ends of the strip off to save a tiny smidgen of weight, but it's very important to cut three small notches about equal distance around one side of the strip. 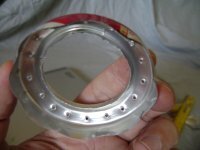 This allows the fuel to flow through the inner wall to the outer wall. It's time to put the three pieces together. 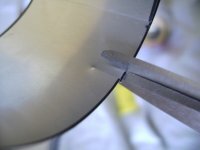 Start by placing the inner wall in the stove bottom, with the notched ends down. Then fit the top of the stove on, tucking the 'tabs' you snipped earlier inside of the stove bottom. A couple of hints to get that top on—it's not as easy as you may think! 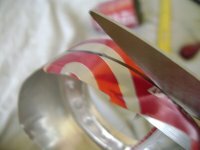 The sharp edges of the 'tabs' tend to get caught up when putting in the top, so curve the tabs slightly inward before you begin. You can see I've done this in the second photo below where it gives the top piece a ruffled look. 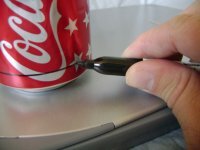 The last bit of the top is hardest to squeeze in, so use a knife or some other thin object like a shoehorn to get it pushed in. Check that the inner wall is fitting into the grove of the stove top properly. Work the top on slowly and evenly, and eventually it'll all fit together like a puzzle. The stove should stay in one piece due to nothing more than the friction of the pieces, but it's not very secure like this. 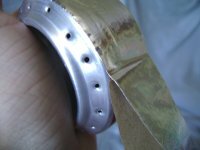 Use the high temperature tape to keep the stove together permanently. 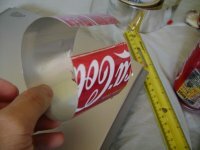 Depending on the width of the tape, you may have to cut it in half like I did. 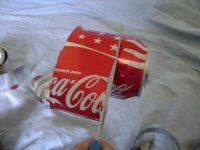 Then wrap it around the stove, securing the top and bottom of the stove together. 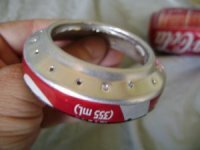 This optional simmer ring comes in handy if you want to bake yourself a treat or if a recipe calls for the food to simmer. 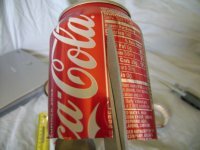 It's made from the top of a soda can. 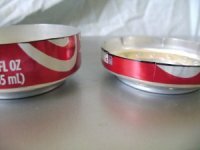 Take off the tabs, then cut it out to just where the can curves downward the length of the can. 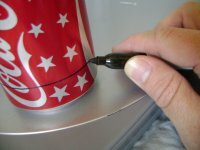 Leave a little too much, then trim a small bit off at a time until it fits snugly over your stove. This snuffer, when placed over a stove, will help you put it out. In general, I recommend just letting whatever leftover alcohol simply burn off. Once, while trying to conserve fuel, I tried to put the flame out, knocked the stove into my lap instead, and lit my crotch on fire. Really, let the alcohol burn off! But if you absolutely must conserve fuel, use this optional snuffer. It will starve the stove of oxygen and snuff out the flame. 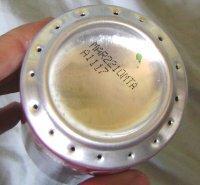 Usually a little oxygen still gets in so you have to tap the lid (not with a finger!) or pour water on it to get the flame completely out, but it will work. 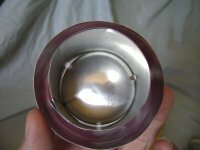 Warnings aside, create the snuffer much like you did with the simmer ring, but use the bottom of a can instead of the top of it. Cut it too high, then trim off thin slices until it fits snugly over the stove. 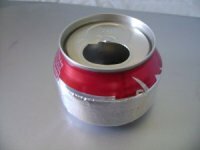 At least, you're done with the soda can stove itself. 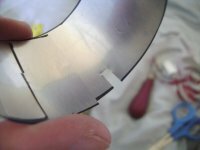 Now you can build a pot support for your stove (and before you ask, a pot support is needed for this design—this stove will not work by putting your pot directly on the stove! 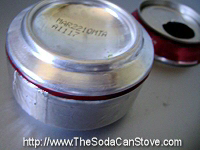 ), find some denatured alcohol and figure out how to use your camp stove. 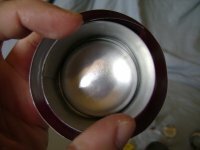 And finally, sometimes, people have reported to me that their stove didn't work for some reason or another, so I've started a troubleshooting page to help out. 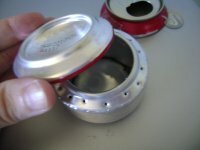 If you're having soda can stove woes, check it out. 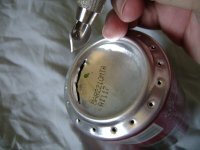 It might have the answer to your problem stove! Enjoy!